All rooms in hotel were completly reconstructed in 2010, so they follow requirements for modern acommodation. Every room has its own hall, bathroom and toalet. There are two single bed, eleven double bed, three triple bed and two apartments with two separate bedrooms with two beds in the hotel. Some of rooms has its own fridge. There is a option to rent TV on your room. There is a free Wi-fi conection in whole hotel. Prices for acommodation are final including energy and recreation fees. 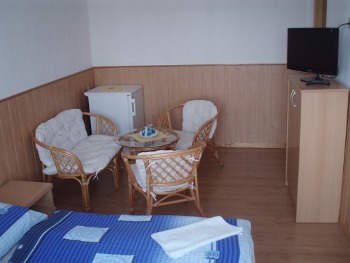 Children under two year without bed-claim are for free, children under 10 have discount: 50,-Kč per night. There is limited count of TVs for rent. Rental fee is 50Kč per one day. acommodation of guests is possible after 14:00. For earlier onset, please contact us.